I recently stumbled upon this infographic from the Croatian National Tourist Board, and thought I’d share it today. It carried out extensive research to find out what is the ideal holiday for people in the UK and 10 more countries. 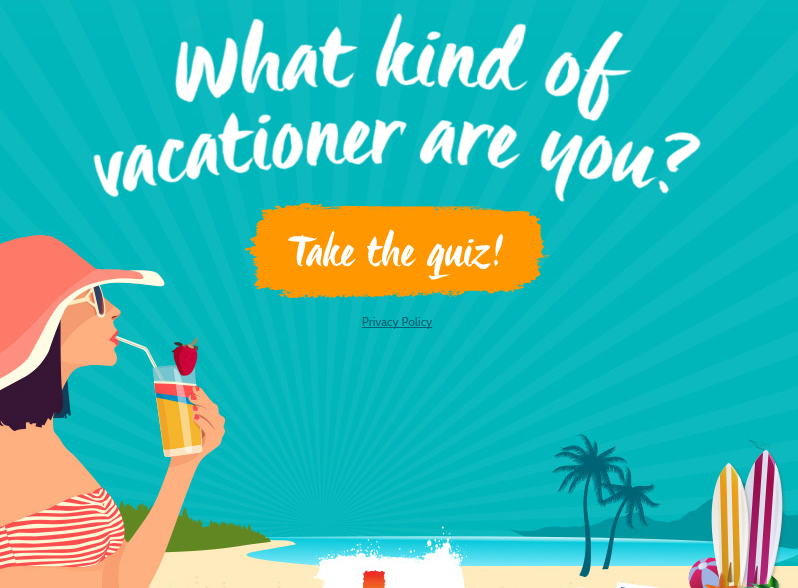 If you want to find out which type of holiday maker you are, you can take their quiz here. 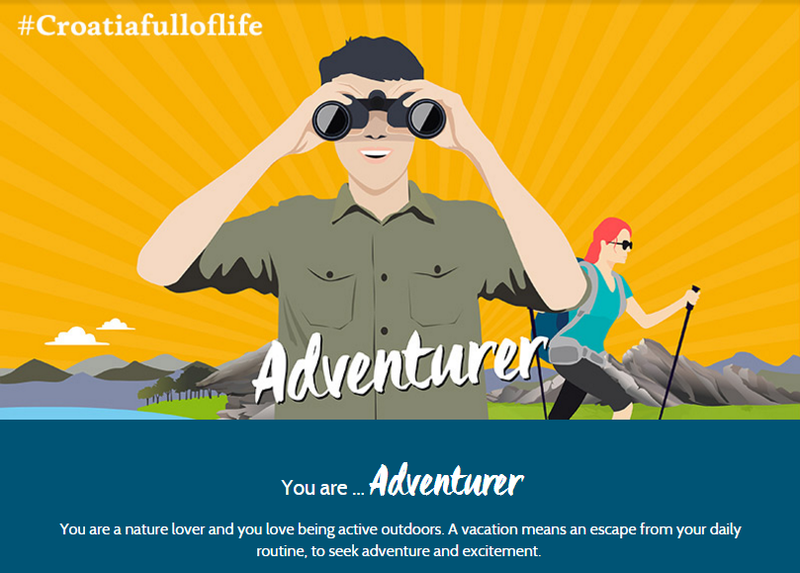 Not too surprisingly, I found out I was… an adventurer. I love an active holiday. I get itchy after two hours on the beach. I have to go do something, explore every corner and make sure I have seen it all before I go home. It does make for quite an intense holiday, but I generally go home with more energy than I left. There are seven types of holiday makers on that quizz. Adventurers like me, who are looking for new stuff to experience, family organisers, who want a safe and pleasant holiday, romantics, who mostly want to have a good time with their loved ones. Young and free, who holiday for the first time, culture vultures, who prefer museums and tours to beach resorts, beach bunnies, who like exactly the opposite, sun and sea, and the go native, who want to experience local life before all. For all these types of people, the Croatian National Tourist Board has the perfect holiday planned. Having traveled to Croatia a few times, I can definitely vouch for that. The beaches are amazing, warm and quiet, you can find resort towns if that is what you are looking for, but also deserted stretches of sand if you’d rather feel like Robinson Crusoe. It has a ton of cultural things to do as well, with medieval towns, museums, old forts… As a crossroad for different cultures, its cuisine is varied and delicious, and to keep fit, you’ll find a lot of cool places to have an adventure. Locals are friendly, most young people speak really good English so you will not have a hard time trying to book a tour or order something on the menu, and all year round, you will have plenty of festivals to see glimpses or Croatian traditions. What I loved most was the fact that every town, even the smaller ones, were very lively. People work hard, go out, harvest… While in the UK you often see villages where shops are closing and people are living to bigger towns. Croatia is very dynamic in that sense. A three hour flight from London, you will feel far while being close to home. The only inconvenience maybe is that they are using their own currency, the Kuna, so if you plan on visiting nearby Montenegro and Slovenia as well, you will need both Euros and Kunas, and I had to get special insurance for my car, while my UK insurance was covering the rest of the Schengen countries at no extra cost. That said, Croatia is a very affordable destination, you can easily eat for under £8, sleep at a local guest house for £20, and petrol is slightly less expensive as well. I highly recommend you rent a car and go around the country to explore all it has to offer, as the North is very different from the South, and both have a lot of wonders worth knowing.